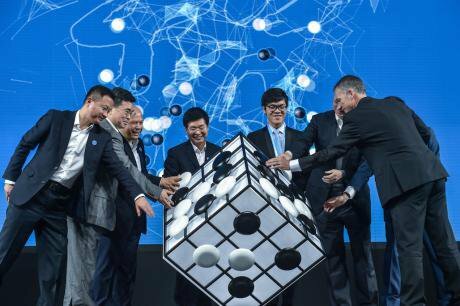 Wuzhen, May 23, 2017: Chinese Go player Ke Jie and other guests attend the opening ceremony of the Future of Go Summit before a match between him and Google's artificial intelligence program AlphaGo in Wuzhen, east China's Zhejiang province, May 23, 2017. Xu Yu/PA Images. All rights reserved.Earlier this fall, on the morning of the 20th of September, Spanish police raided the offices of the organization in charge of managing the domain name commonly used by Catalonian websites, '.cat'. The ensuing seizure of the registry’s computers, arrest of its director for sedition, and deletion of domains promoting the October 1st independence referendum sound like a scene from some dystopian cyberpunk future. This heavy-handed instance of online censorship by Spanish police is part of a growing focus by governments on controlling the twenty-first century’s public square, the internet. Most internet users today take for granted their ability to instantly retrieve information and communicate across an open and secure, globalized web. However, the internet’s structure is continually evolving and regularly contested. Just because the internet has so far operated in line with principles inherited from its original creators, emphasizing interoperability and free expression, does not mean it always must or will. Increased control of the internet’s global infrastructure by authoritarian state actors would, of course, lead to more fragmentation and more censorship. In fact, the recent and intensifying push by governments to promote the concept of “digital sovereignty” represents a real and rising threat to the internet as a force for good. China, the world’s most sophisticated online censor, will host the fourth iteration of its Wuzhen Summit this December. The Wuzhen Summit is China’s attempt to create an alternative to the Internet Governance Forum (an annual multi-stakeholder forum for global policy dialogue on internet governance issues) that reflects its state-led vision for the future of the internet. In his keynote speech opening the 2015 Wuzhen summit, Chinese President Xi Jinping said “we should respect the right of individual countries to independently choose their own path of cyber development, model of cyber regulation and internet public policies, and participate in international cyberspace governance on an equal footing.” Increased control of the internet’s global infrastructure by authoritarian state actors would, of course, lead to more fragmentation and more censorship. Proponents of cyber sovereignty are moving to expand the influence of bodies more amenable to their concept of internet governance, such as the International Telecommunication Union, a UN agency originally founded to coordinate global telegraph and telephone transmission protocols. Through a range of proposals on cybersecurity and other topics at an ITU conference this October, Brazil, Mexico, the Arab States, and a regional bloc formed by Russia and many former Soviet republics, all suggested that the ITU should expand its mandate into privacy-related issues. The digital rights groups Article 19, Public Knowledge, and Access Now raised concerns about this development, stating that “any discussion of the regulatory or policy aspects of privacy must be driven by the public interest, which should be determined through a human rights framework. These discussions must be conducted in open and transparent forums. The ITU, however, is neither an open forum, nor one that is specialized to address privacy.” While the technicalities of internet governance may seem remote, boring, or trivial, its potential impact on key values like freedom of speech in today’s online world should not be underestimated. As part of its #KeepItOn campaign, Access Now has documented 55 intentional disruptions of the internet or mobile apps to control what people say or do in 2016, in most cases by governments, and 61 disruptions over the first three quarters of 2017. Often, such as with the Egyptian internet outages in 2011 or Russia’s internet blacklist since 2012, states pressure their internet service providers in order to control citizens’ internet access and censor content. However, numerous infrastructure concentration points provide opportunities for the disruption of digital networks, and the further that governments’ tentacles reach into internet governance processes, the greater the likelihood they will pursue political goals by leveraging technical architecture in various ways. Moreover, the very design of the internet’s structure is not neutral, but rather a reflection of values held by its creators emphasizing interoperability and free expression. This, of course, may be at risk to the extent that standards bodies are captured by actors promoting other values as the internet continues to evolve. The further that governments’ tentacles reach into internet governance processes, the greater the likelihood they will pursue political goals by leveraging technical architecture in various ways. Recent controversy surrounded the transfer in October 2016 of ultimate control over management of the domain name system, the internet’s “phone book,” from the US government to an international multistakeholder community made up of commercial actors, technical experts, academics, civil society, and governments. Dire warnings around the possibility of ICANN, the internet governance body in question, immediately falling under Chinese or Russian control have predictably not come true. However, ICANN’s assurance that it “is a technical organization and does not have the remit or ability to regulate content on the internet” also betrays a failure of imagination, assuming the young organization will always necessarily continue to operate as it has over its first nineteen years. Domain name seizures are routinely carried out to enforce copyright laws for example, and the September raid by Spanish police of a domain registry in order to censor access to websites promoting Catalonian independence show that governments increasingly understand how technical architecture like the domain name system can also be utilized for political ends. The key to sustaining healthy governance of the internet is promoting robust democratic voices within the multistakeholder communities shaping the internet’s evolving structure, in contrast to state-led visions of cyber sovereignty. These communities can protect internet governance bodies and processes from capture by actors with agendas inimical to the internet’s core values of interoperability and free expression. Another important step is formally integrating human rights impact assessments into the processes for reviewing new protocols and policies at internet governance bodies, such as Article 19 recently introduced for engineers working in Internet Engineering Task Force (IETF) and as ICANN moved towards in its adoption of a human rights bylaw in 2016. Otherwise, it is possible a very different vision of the internet could become tomorrow’s reality.